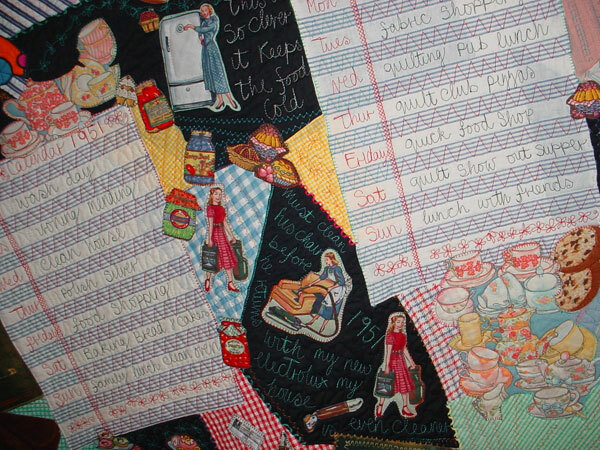 Dorothy made her ‘Freedom from Housework’ quilt using household textiles including J-cloths and tea towels, as well as fabric depicting 50s style women doing chores. She made the quilt for a competition and it went on to be displayed around the world. Dorothy liked to design her quilts to show her humour and spent many years doing exhibitions and talks about her quilts but has since moved on to making collages. Jan Godding [JG]: Good morning. It’s the 16th of September 20016, 9.50am, and I’m interviewing Dorothy Stapleton in her home in Leatherhead in Surrey. Good morning Dorothy. Thank you very much for um talking to us again. Dorothy Stapleton [DS]: Morning Jan.
JG: We’ve got the quilt in front of us, and it would be really nice to hear from you how you chose this quilt and what it means to you. DS: …it’s rather a busy quilt. Um it was the Husqvarna Viking first competition, and they sent, I think it was probably in the magazines or maybe I got an email, saying they had this competition, and it was a worldwide thing and the subject was Feel Free. And it said feel free to do anything you like to do, crazy things with your quilts, and I thought it sounded a bit up my street. The, the rules were it had to be a metre-square, and I’m not very good at getting straight edges, so I decided to have wobbly edges purposefully on my quilt. DS: …and I wanted to use anything I could lay my hands on, and that caused a bit of a stir, and so this was about ten years later I decided to make this new houseworky type quilt. JG: So which year was this? DS: Uh no it was 2001. DS: So I decided to have a cab… One of the… Two of the, the bits it’s all appliquéd on to a background, and there’s a lot of free machine writing on it, and all kinds of bizarre fabrics; I’ve included J-cloths, I’ve got old buttons that were the kind of Liberty bodice buttons, [laughs] I’ve got um the rubber ones. JG: Uh, no, no, they’re not the rubber ones, they’re sort of fabricy. DS: Right. Um I’ve got teacups. I’ve got some extraordinary fabric I bought when I was in America teaching at the Houston Festival one year, and it’s got 1950’s housewives with their equipment, so they’ve got vacuum cleaners and um a fridge, and they’re pointing at them as if they’re something absolutely weird and uh clever, so that’s what made me do one of the calendars. It’s a sort of like a calendar of events. So one of them’s 1950 one, and one of them is 2001, which was the, the, the year I made it. Do you want me to read out what’s on it or not? JG: No, that’s fine because I took pictures of it, yes. DS: Oh right. Okay, fine. JG: So, calendar of events all through the time, right. JG: It’s extremely colourful but restrained at the same time. It’s very unusual. DS: Oh, do you think so? DS: The organisers said when it was on view that the, the competition, the final or the… they wrote to me and said, ‘You have won the Sense of Humour Award,’ which I didn’t even know there was one, um, [laughs] and they said uh, ‘We would like to invite you to Barcelona to receive your prize of a Husqvarna Viking top of the range machine, and we will pay you and your husband’s air fare and hotel bill,’ which was very nice. But unfortunately, or fortunately, I had… I was teaching at the festival, so I’d already booked our hotel and our, and our air fare, but they did actually pay it all and we had a grand um sort of um giving… Well, they didn’t actually give me, me the machine then, they gave me a big bunch of flowers, and I collected or they delivered the machine um from a local shop and I had to go to Wimbledon to have a day of how to use it, which was very nice. DS: So um yeah so I was really lucky. 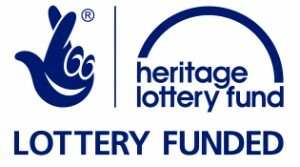 JG: A jolly good prize. DS: Yes. No, it was great! And then the Quilts For A Year went all ’round the world so and they did a book of it as well, a book, a sort of book thing, so it was a good um, you know, it was very nice to know that my quilt had been to places like Japan and places in America I’d never been to. And when I got it back it was in perfect condition so that’s good. JG: Mmm. Right. And where does it live now? DS: Well normally it lives in my studio. But last summer I did the open studios…I now do quite a lot…I’m not quilting anymore in fact, but I do a lot of collage and printing and painting, so the wall that it normally lives on has been taken up with some pictures which I haven’t got ’round to removing yet, so it will go back in there. And because there’s a big picture window, when you drive in the drive you can see it through the window and it’s quite bright [laughs]. JG: Mmm. That’s lovely. Right. Um you, you chose this one. 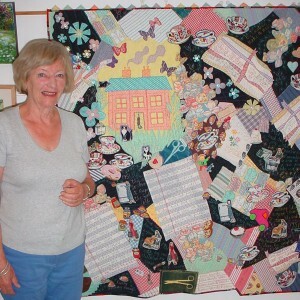 Why, why this particular one because you actually were quite a prolific quilter with lots of other…? JG: The binding looks lovely. DS: …and the top I’ve got prairie points made of J-cloths, [laughs] but that’s because when I actually measured it it was an inch too short for the requirements, so I had to enlarge it by having them sticking up on the top. JG: …the prairie points and um J-clothes [laughs]. Brilliant. And the binding is super-duper. DS: It turns out you could get different coloured J-cloths and June Barnes, one of the quilters, gave me purple ones which apparently you could get in East Sussex which I’d never seen around here so [laughs], I’ve got lots of J-cloths in my wor…, in my kitchen cupboard with holes cut out of them now [laughs]. JG: Yeah. Right, you said that you don’t make quilts anymore, but uh what did [even] start you off right at the beginning? DS: …instead of slides. But then it got more complicated. I went to Norway a couple of times, I went to Houston a couple of times, and then I went six weeks to Australia and um had an exhibition at the Sydney um Exhibition Centre and went to lots of different places in Australia on the train and plane, with all these wretched quilts in a big [laughs] bag. So … so then my husband wanted to retire, and I said, ‘Well I can’t stop doing this ’cause I’ve got bookings two years ahead.’ But I worked through my bookings and then decided to say, ‘Right, that’s it, I’ve done it for 22 years, I’m, you know, I’m giving up, and just want to do, just quilt maybe a little bit for pleasure.’ And then sadly he died about six months later of a rare heart condition, so I was really glad that I had given it up because it was a sort of two-man show; he used to come and drive and all the ladies said, ‘Oh, you poor thing, I bet, I bet you never get a square meal,’ and all this kind [laughs] of thing, and he lapped it up, he loved it. So really then I started doing collage and painting and things I’d done years ago when I went to art school, yeah. 0:11:25 DS: Yes, so… Yes. JG: …but just not quilts? Yes. DS: No. And also I think the sort of scissor skills you get from quilting are very useful with collage [laughter]. JG: Yes. 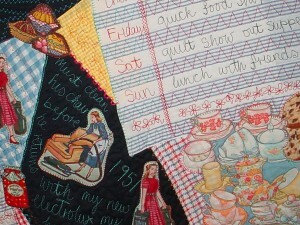 Were there any other quilters in your family or? DS: No. Um. One of my sisters was a book illustrator, and I think the others can’t even sew; I’ve got three sisters. Um I think I was the only person that owned a sewing machine [laughs]. JG: It sounds as though they might have done other creative things. JG: Right. Um but Margaret Jordan was obviously quite an influence in the area because a couple of people have mentioned her classes? DS: Oh yes. Yes, yes, she was amazing. JG: Yes. And you s… you talked early on about making… winning a top of the range machine. Did you always do mainly machine work? DS: …and I found that was very comforting sitting in the evening [laughs] with a quilt on your knee watching television. JG: Yeah. And obviously the number you’ve made over the years must… with all the ones that you’ve given away to quite a large family it must be quite considerable? DS: Yes, tenacious than others aren’t they? DS: So basically in my loft I’ve got a sort of stack of these quilts, and goodness knows what the children will do when I peg out so [laughs]. JG: … and I remember a book where you did pictures with Log Cabin. DS: Yes, I did lots of pictures with Log Cabin. Um I did houses and mountains [laughs], ’cause I undertook to do a book called Log Cabin and beyond which was all pictures from Log Cabin and then it was getting more and more difficult [laughs] to try and think of pictures. But I did a Scottish landscape with um all different bits of um… well tartan fabric basically, and I did quite a lot of Log Cabin on a base of gridded Vilene, which is brilliant because it’s it makes it very accurate. DS: I started off doing John’s shirts. There’s actually one over here. Sorry um. DS: Yes, which is minute but do you want me to bring it over or not? DS: No. That’s liberty lawn. JG: …it was entirely different and they all kept coming back to it. DS: Yes. Yes. And that’s like sometimes you can see a quilt and then you see a picture of it in a magazine and you think, ‘Wow, that looks amazing,’ because you’re being too close to it so you can’t see the colour balance, yeah. JG: Yeah. And were there any particular quilters that you admired and liked their work? DS: Um, oh yes I suppose quite a lot. I mean June Barnes did the most amazing quilt. Um. Trying to think um. Um, oh sorry [laughs]. It seems now such a long time ago. Um. Yes, I mean I do admire people who do absolutely exquisite traditional quilts even though that’s not really my thing. Um. I’m trying to think. Uh oh when I went to America to the Houston show I mean some of the, some of the things looked amazing, I mean Ricky Tims and people like that. But um, but some of them I felt were almost too photographic, for me, but you know that’s, that’s my preference. JG: …who had replicated lace in black and white, and people thought the fabric behind was dyed. But it wasn’t, it was actually the shade of thread she’d used. DS: Goodness me, yes, yes. JG: And it was such a tour de force and I think we all went home and decided that, well perhaps we’ll take up a little light something now. DS: Yes [laughs]. Oh Gloria um, oh goodness me. DS: She done amazing quilts and I actually stayed with her in Australia, and she drove me t… uh well her husband drove us for a whole day right across this very barren bit of Australia to a quilt um event, and she, she and her husband used to go in a campervan, and she would actually do quilts, um dye them with all these dyes actually in situ on bits of old stones and things. A really delightful lady and very, very clever. And I think she’d, she’d overcome quite serious illness and still was do… and I’m not sure she… I presume she’s still quilting. JG: She’s still quilting in a big way, yes. JG: Yes so she’s lasted a long, long, a long time. DS: Yes. Yes. Yes. No, her quilts were absolutely superb. DS: I honestly don’t know! I mean in a way my son kept them saying, ‘Oh, you know, when you die they ought to go somewhere and all be exhibited,’ but you know what do I do with them? 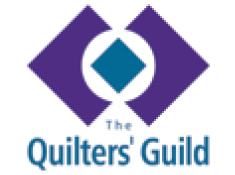 I mean, presumably people like The Quilters’ Guild don’t want them, and um I don’t know. Ho… Well hopefully they won’t go in a skip [laughs]. JG: I’m sure they won’t. If he… If they do I shall smack him myself. DS: Yeah, yeah [laughter]. You’ll come around and look in the skip. Yeah. JG: What do you think is the sort of biggest challenge though for quilters today? DS: [Sighs] I suppose to be recognised as an art form. I mean well that’s if they want to, I mean you know if they are wall quilts and they’re meant to be like a pic… uh as… instead of a picture on the wall, to be recognised as such. JG: … and, and we’re back to square one again, yes. DS: Yes. And also to be treated with reverence you know because they are fragile, and also they can fade and you know. DS: Oh no! Oh, goodness me, yes. JG: … last autumn, yes. Not enough footfall. JG: … to um display quilts in the way that they need to be displayed. JG: And the other thing that that’s been a big change is the technology being used. JG: …and it’s very difficult when you’re hand quilting to see that the two things are the same. DS: …but the long-arm quilting I’m not even sure how it works, but on the other hand I think that, you know, there should be a different category for hand quilting and long-arm quilting. JG: But that is only one of the technologies I think that um … of the sewing machines these days. For one thing they’re a major investment. JG: Um and they also do as many embroidery stitches like blanket stitch. JG: I could never understand how they could possibly do that. DS: …and so I said, a ‘Okay, right,’ you know and she thought it was brilliant, she was pressing buttons and but the modern child is used to [laughs] all these things. JG: Yes and they have no fear. DS: No. No. No. Mind you, when her brother got going on it he managed to gunge up the whole of the, the bobbin bit that I had [laughs] to take the machine apart virtually to do… sort it out. JG: Yeah. But I think we’ve gone thr… past the um hump now of uh young people not doing any hand things so yes. DS: It’s within the technology and the IT that goes with it. DS: And also now um they’re doing fabrics at GCSE. DS: One of my granddaughters did it. I gave her a lot of um my quilting fabric and she made some lovely long sort of like sausage cushion things with lots of embroidery and things on it so, yes I think you know young children and boys and girls you know are, are getting into it which is good. DS: I had an Elna Lotus machine and my son was making model boats and he used to make the sails and say, ‘It’s a Lotus,’ and he was zooming along [laughter]. It was a racing car. JG: …the reminiscences that come out of having seen you, heard you, looked at your quilts from 20, 30 years back so that’s enormous! DS: Oh, really? Oh, that’s wonderful! Oh, good! Yeah. DS: Oh, well, [laughs] it wasn’t in vain. [laughter] I mean I thoroughly enjoyed it. I mean you know it was really nice and to hear all the people laughing and, you know, this kind of thing was great, yeah. JG: Right, thank you very much Dorothy. Is there anything else that you’d like to um re… re…? DS: Um. No, I don’t think so, but thank you very much for asking me and I’m sorry that I’m a bit of a fraud ’cause I’m not now a major quilter! JG: …as to why it happens because it does happen. DS: And I suppose in a way I didn’t want to be sort of the old bird standing there thinking, ‘Oh no, not her again,’ you know? And people said, ‘You can’t retire,’ and I thought, ‘Well, through circumstances I did,’ and as it so happened I’m really glad I did because it would have been quite a difficult thing to go to different places and you know, and so you know now life’s opened up new opportunities with different forms of creativity so. JG: Yeah. Thank you very much indeed. DS: Right, thank you Jan.